I am quite proud of this little hack that I have come up with to protect the sharp edges of my woodworking chisels. Having spent time bringing the tools up to razor sharpness the last thing I want is to accidentally chip them when they are rattling around in my toolbox amongst pliers, hammers, etc. 1. Wrap the end of the chisel with a thin layer of cling film. A couple of layers is sufficient. 2. Place a small magnet on the cling film close to the end of the chisel. 3. Mold Sugru into a thin sheet and wrap it around the chisel end, encasing the magnet. 4. Smooth the Sugru and leave to set. 5. When the Sugru has set pull the cap off the chisel. 6. 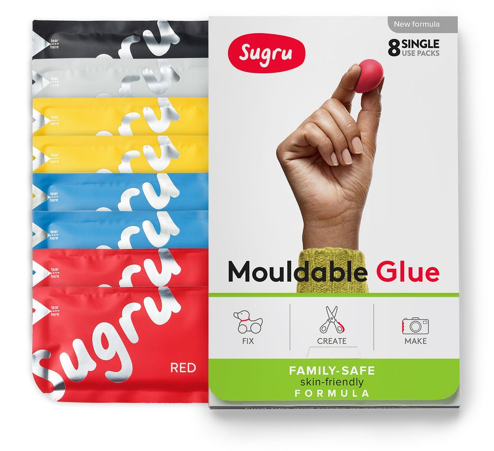 Carefully pull the cling film out of the Sugru cap. 7. You now have a protective cap which will not fall off the chisel, unlike the poor plastic sleeves supplied by chisel suppliers. You can also colour code your chisel sizes by using different coloured Sugru, so if you have several chisels of the same size they can be fitted with the same coloured cap. Make a robust and shock resistant GoPro mount for a mountain bike.